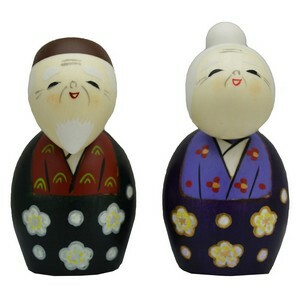 Old couple Kokeshi Doll pair called Tomoshiraga in Japanese, which means turning grey together. Kokeshi, first made in Northern Japan as toys for children, are characterised by their simple limbless design. Handcrafted and painted wearing attractive colourful kimonos, they make beautiful gifts. Made in Japan.